That building behind the cast is “Downton Abbey”–a true throwback to the middle ages. So I’m just gonna put it out there: I really enjoy watching Downton Abbey. I’ve watched my share of TV shows in recent years, and Downton has won my allegiance like Peter Jackson after two Lord of the Rings movies back in 2002. You can find full summaries of the first two seasons easily enough online, so I’ll leave it to say that Downton Abbey is set around a noble family in a mythical town of Downton, England in the early part of the 20th century. The first season began with the sinking of the Titanic (1912), and the second season included the First World War (1914-1918). A quick SPOILER ALERT: if anyone hasn’t watched the first two episodes of the third season, and wants to be surprised by the events within, you may not want to read the rest of the post. The third season welcomed us into the roaring 1920’s replete with a wedding between two star-crossed lovers from the first two seasons. In the most recent episode, we had several intriguing plot lines develop: Mrs. Hughes (the Housekeeper: the highest ranking female servant) continued in her serious concerns about a cyst which, in the end, turned out not to be malignant. Mr. Bates (a once high-ranking servant at Downton) remains locked in prison for allegedly poisoning his late wife, while his current wife, Anna, desperately tries to prove him innocent while remaining in service to Downton. 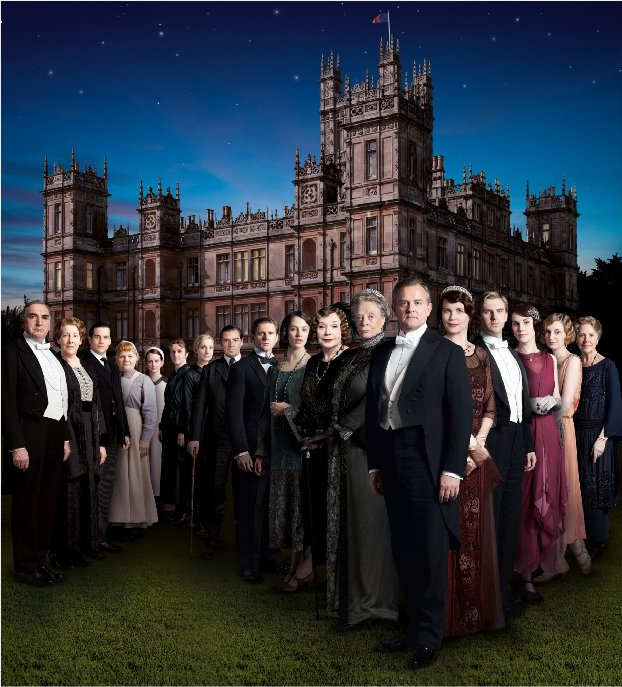 The entire Downton fortune nearly comes tumbling down, only to be saved by a seemingly-providential-only-on-tv fortune left to the Heir of Downton (Sir Matthew Crawley) by his late fiancee’s father, which Sir Matthew only accepted after a fair amount of drama, of course. Lady Edith, the middle and only unmarried sister, finally sets a date to be married with an older man whom the family does not respect, only to be dramatically left at the altar and sent weeping from the church! This scene was unquestionably the highlight of episode two in my book, a very welcome surprise in the all-too-predictable world of television drama. Because I enjoy watching this show and find it to have redeemable themes and a compelling narrative in contemporary culture, I’ve decided to start blogging about it. Each week I will pick out a certain theme and reflect on it theologically, not necessarily sticking to Downton’s script but using the show as a springboard for better discussion. Hopefully this adventure will bear fruit. This week, I wanted to spend a minute reflecting on the cultural divide between servants and nobility in 1920’s British culture, especially as evidenced in the beginning of season three. Several exterior factions threaten this traditional culture: the youngest daughter’s (Lady Sybil) marriage to the ex-chauffeur (Tom Branson) and their residence in politically divisive Ireland; the visit of Cora’s (Countess of Downton) mother from the United States, bringing with her an exceptional derision of the two-tiered culture of British life; and, finally, the end of World War I and the rise of the 1920’s. Even the newly married heir and oldest daughter (Sir Matthew and Lady Mary) embrace some of the new traditions by purchasing their own car and driving home after their honeymoon. These plot lines make for excellent storytelling and revolve around one of the most compelling questions in the drama itself: was the era of nobility and servants only a good era if you lived among nobility? In terms of Christianity, the tradition of well-respected servants goes back thousands of years, being a part of culture at least since the time of King David, likely even further. In contemporary language, however, the notion of “servants” is almost inexorably tied to the concept of “slavery,” and all the horribly un-Christian things about the bestial practice that endured for centuries publicly and still exists in the private lives of the corrupt wealthy in the modern world. Servants, on the other hand, existed and held much esteem thousands of years before the African slave trade was invented, and continue to exist today. In today’s world, the class of servants might better be described as domestic-related-jobs, ranging from chefs to personal assistants to interior designers to house-cleaners. The White House employs hundreds of such people who clearly occupy a different social status than the President and the various “Secretaries” who hold vast political powers. The U.S. Constitution and Bill of Rights are far from perfect documents, and, much as some might like to think, they did not guarantee perfect freedom for citizens of the United States. Social classes and hierarchies still exist throughout American culture. For me, the struggles of the servant class in Downton Abbey are far more relatable than the struggles of the nobility, except when relationships and faith come into play. And isn’t this the beauty of the drama and the two-tiered social structure? There is no false hope of breaching the noble class for those born in the servant class, but as long as the nobility pay them well and treat them fairly, life moves on: both classes have good and bad relationships, both classes of society have the honest and the cruel. Both live in a working and necessary relationship: the wealth of the nobility is only theirs as long as they fairly employ a large chunk of the working class in the city in which they live. People will always live in varying social classes, usually based upon the occupations of those within a family unit. There will always be politicians, there will always be janitors, and there will always be groundskeepers, and there will always be the various rungs of the business world ladder, from paper-pushers to corporate executives. And, of course, there will always be families living off “minimum wage,” that always-too-low amount that many companies rely on to pay both a 40-year-old single mother and a 16-year-old high school sophomore who served french fries to me over Christmas break. Life is not fair. But, without question, God is. The wealthy, not the poor, have the impossible task of going through the eye of the needle (Matt 19; Mark 10; Luke 18). The wealthy are called to give their possessions to the poor, while the poor widow’s offering is glorified (Mark 12; Luke 21). In God’s world, the land-owner pays both the 1-hour worker and the 8-hour worker the same honest wage (Matt 20), and the destitute beggar sits in the bosom of Abraham while generations of the wealthy wail and gnash their teeth for not being charitable and merciful to those around them (Luke 12). It is a confusing world, this Christian life, especially within an American culture where “merit” and “hard work” seem to found our very national identity. No, God seems to say, through so many prophets and writers and even Christ himself, merit does not matter, and hard work is often vanity. Only righteousness matters; only charity matters; only love matters; only hope matters; only mercy matters. The facade of culture is only ever temporary.